Our Good Neighbor Policy isn't paying off! It's true — smoking DOES cause cancer! Smoking IS injurious to health! Read, in this article, backed up by plenty of statistical PROOF, what your Creator says about smoking! LAST year, Americans alone smoked 532.7 BILLION cigarettes — 6.7 billion cigars, and used 120,000 tons of pipe and chewing tobacco. Worldwide, all nations combined smoked 2.6 trillion cigarettes. According to the Food and Agriculture Organization of the U.N., this total grows by 70 billion (3%) each year - faster than the population increase! Americans as a nation are beginning to smoke less! Approximately 18 billion fewer cigarettes were smoked in 1969 than in 1968. Over a million smokers quit each year, and the ex-smokers in America now number twenty million, or one in ten citizens. Still the smoking population numbers over 50 million, or one in two adult males, and one in three adult females. The average smoker uses over 10,000 cigarettes each year, or one-and-a-half packs daily. Tobacco is the nation's fifth largest cash crop, and the third largest crop for export. It is grown on 750,000 farms and, for most of these families, provides their major cash income. The tobacco weed is processed in 550 factories in 30 states, employing more than 96,000 people, drawing an estimated payroll of 379 million dollars per year. All this does not mention the obvious consumption of paper, aluminum foil, cellophane, cardboard and use of trucking services, promotions, writers, designers, advertisers, and the tremendous sums (running into the multiple millions of dollars per year) spent through the commercial advertising media to encourage people to smoke. And all this still does not mention the more than 4500 wholesalers and 1,500,000 retailers involved in moving the weed, now carefully packaged into some "special blend" or another (perhaps, according to one claim, with the cut tobacco even laid "end to end! "), from the growing patch to the stained forefingers of the consumer. Smoking is truly BIG business! It's part and parcel with social custom, part of the fond recollections of every family, a little bit of our history — and a huge, billowing, gray and ash-filled cloud that blinds our eyes, strangles our lungs, pollutes our cities, and kills hundreds of thousands of us every year! How many times do families reminisce about granddad and his fireside pipe? How many acquaintances were begun over the question, "Gotta match?" To how many millions of human individuals is the act of taking a cigarette from a pack, tamping it on the thumbnail, and expertly lighting it in one manner or another the epitome of all social graces? To how many Americans, Britons, Australians, Europeans, and, for that matter, members of all races, is the "cigarette break" a consummate desire in their lives? The dollars' volume of the sign painting industry alone, providing all the "smoking" or "no smoking" signs would be staggering! The average non-smoker, who returns home from ANY restaurant, sports event, plane trip or shoeshine parlor with his clothes and his hair reeking with a blend of dozens of cigarettes and cigars knows that smoking IS truly BIG BUSINESS! But is it good business? Is it right business? Is it profitable business — physically and spiritually? There is no question about its profitableness to those who raise it, package and promote it, and those who slap taxes upon it! The question is: Should YOU smoke it? Should YOU buy it? Is it a SIN for you to smoke? The facts are in. Smoking really DOES cause cancer. Incontrovertible facts have been laboriously compiled over many YEARS, by many different researchers. The British Government was first to publicly state smoking caused cancer. Canada followed — and, finally, the United States. No need to quote here the monumental case histories which factually PROVE smoking causes cancer. But what has been the public reaction to the government report? A survey conducted by United Press International showed the public reaction ranged all the way from some who said, "I'm going to quit," to those who said, "I'd like to see them MAKE me quit!" But far more prevalent were those who took the usual philosophical view of their personal lusts and pleasures. "I'm not going to give up smoking," said Lupe G., Los Angeles cashier. "I may die young, but I'll die happy." Edward J. T., Cleveland, Ohio, Linotype operator, said, "You gotta die from something, don't you?" According to the United Press Report, many smokers indicated they would continue right on smoking cigarettes, or maybe just cut down a little, because they got too much pleasure from smoking or felt they would be unable to shake the habit. "Smoking is one of the few things in life I can possibly enjoy any place outside of church. I will continue smoking," St. Louis radio announcer James P., said. "I'm not planning to quit. I've been smoking 30 years and I enjoy it," E.J. D., Pittsburgh jewelry store manager, said. Richard O., 19, Chicago telephoto operator, said, "the report doesn't worry me. I'm in fairly good physical shape. I won't cut back." "I'd like to give up cigarettes, but I can't. The habit is too strong," New York housewife Saralee G. B., said. "My husband quit cigarettes, but it was easy 'for him; he had cigars to fall back on." Another housewife, Mrs. Geraldine H., 19, Des Moines, Iowa, said "I'm concerned about the reports, but I've tried to stop and I couldn't." "I really don't believe there's anything to this lung cancer stuff," said Walter J., Des Moines Jewelry store operator. "I really think I shouldn't smoke, but it's kind of hard to quit. I'm going to think about it," said Mrs. Norman G. N, Hopkins, Minn.
Mrs. Dominic G., Cleveland bookkeeper, said she smokes at least three packs a day and "I'm scared. I don't know if I can stop, but I will try — for the Nth time." The "what me worry?" nonchalance in the face of proven danger in cigarette smoking is one of the many paradoxes of our time! Faced with the biggest issues in the history of mankind; faced with the possibility of annihilation of every man, woman and child on the face of the earth; most people are on a pleasure binge — seeking only to satisfy the lusts of the flesh! What Do the Churches Say. About It? 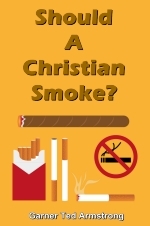 When many religionists were asked the question, "Is smoking a sin?" the answers ranged from "yes" to "no" to "sometimes." Some even said "maybe." According to another report by United Press, the opinions of various church leaders "cut across sect lines." As a matter of fact, the United Press Report said "a few noted church officials smoked as they voiced their views on the subject," and that's just it! They voiced "THEIR VIEWS" but apparently did not bother to research into the Bible to find out what GOD says about smoking! One man said those who "fail to make a reasonable attempt to stop smoking are committing a sin." Another theologian said if a person is warned by a physician to stop smoking "and fails to do so, the sin is mortal." Still another, commenting on the previous quotation, said that he couldn't go along with most of what the other theologian had said. He continued, "I am smoking a cigar right now and believe there is nothing fundamentally wrong — that's not a sin." A prominent pastor of a church for 52 years, and a pipe smoker, said "smoking and the use of tobacco are not moral issues but the personal business of the individual." He continued, "If it affects his health, as it undoubtedly does, and he continues to smoke, I don't think it is a sin but I think it's downright FOOLISH!" (Emphasis mine) Amazing! With a pipe clamped firmly between his teeth, he stated, "someone continuing to smoke, if it affects his health, is downright foolish!" Some are terribly hard to convince! One minister said, for example, "If smoking is harmful, it is sinful. The question, of course, is whether we have the total proof of its harmfulness." Still another said, "I would be inclined to say it is up to the individual conscience." Still another said, "Maybe ministers will have to start smoking behind the barn!" Could you base your personal habits on the personal opinions, conflicting points of view, and "watered-down theological approaches you have just read?" But forgetting, for a moment, the various opinions of people — the way "they look at it" — let's find out what the great Creator in heaven above, who gives you every breath of air you breathe, says about it. What Does GOD Say About Smoking? The conclusive facts concerning cigarette smoking stand firm! There is a PROVED relationship between smoking and lung cancer — and no amount of "reasoning" and "rationalizing" will change, alter, or do away with it. These plain facts mean if you are a smoker — you are smoking in spite of grave warnings about the possible consequences. It means you are deliberately subjecting your body which is meant to be the temple of God's Holy Spirit, to punishment and possible agonizing death! "But surely," one might reason, "the BIBLE doesn't say anything in plain language about smoking, does it?" No, the Bible does not contain a direct command — "Thou SHALT NOT SMOKE!" But, for that matter, would men stop smoking if it did? The Bible, says, "THOU SHALT NOT KILL!" Have men everywhere stopped killing? Notice! God is just as concerned about the motive behind the act as He is about the act itself! Jesus said what happened in the heart constituted the sin — AS MUCH AS the literal act itself! The law of God says, "THOU SHALT NOT COVET" or "THOU SHALT NOT LUST!" This point demands of you NOT to do a certain thing! By doing, or committing the act — you become guilty of sin! Remember! "... to him that knoweth to do good, and doeth it not, to him it is sin" (Jas. 4:17). And remember further! It is Almighty GOD who tells you, in His Word, WHAT is sin! God does not allow any man to decide WHAT is sin. He merely allows each individual to choose for himself WHETHER he will obey God's law — or commit sin! The Bible is a book of law! There are laws of health, laws of farming, laws of diet, laws of marriage, laws covering every facet of life REVEALED in the Bible! Jesus said we are to live by EVERY WORD OF GOD! He said any who break even the least of God's commandments will be called LEAST in the Kingdom of heaven! Why do people want to smoke? Dr. Heller, Director of the National Cancer Institute, U.S. Public Health Service, said, "Nobody has ever contended that smoking is good for one from a health point of view." No, they never have! The normal function of the human lungs is drastically impaired by smoking! Not only does smoking prohibit the giving off of poisons which should normally be exhaled through the respiratory system, but it takes in heavy chemicals and tars, placing them on the walls of the lungs, where they are absorbed into the blood stream. This means your physical health is being impaired — REGARDLESS of the arguments of "long-lived" men who smoked until they were 90! After the cancer scare, cigarette manufacturers tried to successfully remove the "tars" from the cigarette smoke. They tried to produce an effective "filtering process" that would completely remove the "harmful tars" from the smoke. These tars were found to have been carcinogenic in certain rats, and therefore were linked as a possible irritant which would produce cancer in the human lungs. Bur! If the cigarette manufacturers were to design the "perfect" filter, NO SMOKE WOULD GET THROUGH — THEN WHY SMOKE? Dr. Heller was asked, "If you had a perfect filter you really wouldn't be smoking, would you?" To this he replied, "Taken to its ultimate conclusion, that's correct. With a perfect filter no smoke would get through — just hot air" (emphasis mine). People assume smokers use the tobacco weed because they desire merely the effects of the nicotine — the drug contained in the tobacco leaf. But, the findings of the American Cancer Society prove otherwise! Dr. Heller said, "... Apparently it's the tars that give him (the smoker) that sense of satisfaction" (emphasis mine). With the inhalation of the tar-laden smoke, these tiny particles attach themselves to the cellular walls of the myriad tiny "bubbles" of membrane, or air pockets, in the lungs. Through the entire lungs an extensive system of capillaries constantly picks up the oxygen and quickly carries it to all parts of the body. The returning blood is supposed to carry waste material, which is then expelled through the lungs. These tars, affixing themselves to the walls of the lungs, are absorbed (chemically) into the blood stream. The actual "pleasure" derived by the smoker is the supplying of these tars, carrying nicotine and various chemicals, to every cell of his body! I used to smoke. I KNOW all the arguments about why a person thinks he should go on smoking. I tried to use them all — and even tried to make up some original ones of my own. But now, years later, I also know smoking is not only PHYSICALLY harmful, and now proved deadly dangerous, but that the DESIRE to smoke — the LUST for the smell of burning tobacco — the URGE to SATISFY the body and its carnal, physical desires, is a SPIRITUAL sin as well! Since smoking is plainly and admittedly seeking gratification of the sensual, physical desires of the SELF — it violates the command of God against coveting, and against idolatry! Smokers LUST for satisfaction. Perhaps you feel that's an "ugly" word! But it's TRUE! And, even if YOU are not a heavy smoker — you cannot argue around it, or reason it away, YOU KNOW IT IS LUST! Your Bible says you should become "obedient children, not fashioning yourselves according to the former LUSTS in your ignorance" (I Pet. 1:14). Smoking is a physical sin! Let's understand why. Christ showed it was sin that had crippled the man at the pool called Bethesda, in Jerusalem. In healing the man, Jesus said, "SIN NO MORE"! (John 5:14) Healing, revealed your Savior, is the forgiveness of sin! (Matt. 9: 2-7) But what kind of sin? There are certain physical laws which God has set in motion. Those laws regulate your body, your health, your life! Take, for an example, the law of gravity. It is real — although you can't see it, you KNOW you'll get hurt if you violate it by a sudden fall! The penalty is physical pain and possible injury. And so it is with your health! If you put wrong foods into your body, or even too much of the RIGHT foods, you SIN against your body — and there is a penalty exacted! In some cases, the penalty is only temporary — but in others, it may mean permanent injury, or death! Smoking stands PROVED to be a definite HARM to the body, as well as a definite RISK of getting lung cancer! But notice further. "What? know ye not that your body is the temple of the Holy Spirit... and ye are not your own? For ye are bought with a price, therefore GLORIFY God in your body, and in your spirit, which are God's" (I Cor. 6:19-20). Does it glorify God — honor God our Creator and the One who gives us every clean breath of air we breathe — are we being obedient to Him, serving Him, glorifying HIM when we lust for the smell of a burning weed? God says, "Whether therefore ye eat, or drink, or WHATSOEVER ye do, DO ALL to the glory of God"! (I Cor. 10:31) Far from glorifying God, the use of tobacco — IN ANY FORM — harms the body, and is offensive, not pleasing, to others around you! Your Bible shows such an act to be sin! But there is ANOTHER sin involved! Just as Dr. Heller said, a smoker can hardly claim he smokes to satisfy others! He does it, admittedly, to SATISFY THE SELF! It is a desire, a thirst for SELF-gratification. It is LUST! It is the popular way, the "way of the crowd" to SATISFY the self! As the article already quoted said, "... It's the tars that give him that sense of satisfaction... They seem to be the important constituent in the satisfaction to the user" (emphasis mine). Your Bible describes today's citizen as a person who is a "lover" of HIS OWN SELF, MORE than a lover of God (II Tim. 3:2-4). But remember, Jesus plainly showed it was the attitude of the heart that was important — as well as the act itself! What is the attitude, the desire of one who lusts for the effects of tobacco? It is one of coveting, of inordinately desiring that which is harmful! Paul sternly warned the Christians at Ephesus, "For this ye know, that no whoremonger, nor unclean person, not covetous man, who is an idolater, hath any inheritance in the kingdom of Christ and of God" (Eph. 5:5). Notice it! Covetousness is also idolatry — putting an object in place of God! And James tells us if we break even ONE point we're guilty of all! The evil desire of the mind — LUSTING after tobacco — becomes a matter of spiritual sin — of sin against character, as well as harm to the physical body! We were intended by the RULER of this universe to live happy, eventful, fruitful lives! There are many things which we may ENJOY through our senses. The proper enjoyment of the senses is not wrong — but right! But proper enjoyment builds up — it never dissipates! We derive pleasure from delicious healthful foods — we enjoy seeing beautiful things, we enjoy hearing beautiful music. We were intended to CULTIVATE and use our senses, but for the constructive purposes — not destructive! It is the UPBUILDING of our health and character for which we seek, not the tearing down — the destruction. God wants us to be happy and healthy! The converted child of God has absolutely FORSAKEN his own way (Isa. 55:7) and has come to realize that the WAY of man is WRONG (Prov. 16:25). Then, after conforming with the conditions, the repentant sinner is PROMISED the Holy Spirit — which is the very nature of God. (Acts 2:38; II Pet. 1:4) If we call ourselves Christians, we're to GROW DAILY more like God (Matt. 5:48). Then, instead of seeking to please ourselves by temporary sensual pleasures which dissipate and injure, we are to forsake the degenerating habits, and give our lives over to God (Rom. 12:1). We are bought with a price (I Cor. 6:20), and are commanded to GLORIFY God in our physical bodies! Are you glorifying God with a cigarette in your mouth? We should live in HARMONY with the laws God has set in motion — not go contrary to them. Physical as well as spiritual laws are included. After God has implanted within us that gift which we LACK to start us toward eternal life (Luke 11:13), He tells us WE ARE HIS TEMPLE! We have His Holy Spirit abiding within us — are bought with a price, and we literally BELONG to God! "Sonny," counseled the elderly man to his grandchild, "don't ever take up smoking!" "But WHY, Grandpa?" asked the child, "YOU smoke!" "I know it, I know it!" he snapped out, "but that's exactly why you should never start. I can't quit!" Thousands have said the same thing. Many smokers would like to quit, but feel they are unable! God labels smoking as a SIN, and tells us, "Let not SIN therefore REIGN [rule] in your mortal body, that ye should obey it in the LUSTS thereof" (Rom. 6:12). God has decreed that "SIN SHALL NOT HAVE DOMINION OVER YOU" (Rom. 6:14). And by ordering that NO sin, regardless of what it may be, can "lord it over" you, God extends a definite, specific PROMISE to any person who really WANTS to quit! "If we confess our sins, He is faithful and just to forgive us our sins, and to CLEANSE us from all unrighteousness" (I John 1:9). GOD HAS OBLIGATED HIMSELF TO CLEANSE US FROM SMOKING when we repent, acknowledge our sin, and CALL ON HIM for the extra help we need! God says He'll HELP you quit — if you sincerely want to, and realize He commands you to! But always remember Lot's wife! Once God HAS intervened, as He has promised He would, and you have SUCCEEDED in rooting out the sin of smoking, don't ever turn to it again! "For if, after they have escaped the pollutions of the world through the knowledge of the Lord and Savior Jesus Christ, they are again entangled therein, and overcome, the latter end is worse with them than the beginning" (II Pet. 2:20). May God grant YOU will take action, and obey the laws He has given for our GOOD! If you have never read our free booklet, The Ten Commandments, write for a copy today. It thoroughly explains these ten major principles of God's Law and how they apply to your everyday life. Also send for your free subscription to TOMORROW'S WORLD, a magazine of Biblical understanding, published by the Graduate School of Theology of Ambassador College. They are sent free as a service in the public interest.